Buy your tickets to see the UConn Huskies women’s basketball from TicketGalaxy.com, a proud partner of UConn Athletics. Cheer on UConn women’s basketball alongside Jonathan the Husky as they compete at the highest level of women’s college basketball. Ticket Galaxy is the Proud Partner of UConn Athletics. UConn’s women’s basketball team was established in 1974. The UConn Huskies NCAA Division I women’s basketball team plays their home games at the Harry A. Gampel Pavilion located in Storrs, CT. In total, the UConn’s women’s basketball have won a total of eleven NCAA Tournament Championships. Their most recent NCAA Tournament Championship was in 2016. The UConn Huskies women’s basketball team owns the two longest winning streaks in all of college basketball history. Their longest streak was 111 wins in a row. Buy your tickets to see the UConn Huskies women’s basketball from TicketGalaxy.com, a proud partner of UConn Athletics. Cheer on UConn women’s basketball alongside Jonathan the Husky as they compete at the highest level of women’s college basketball. Ticket Galaxy is the Proud Partner of UConn Athletics. Visit the official UConn Women's Basketball page for more information. Purchase your UConn Women's Basketball tickets at Ticket Galaxy! Choose your event date and click "Find Tickets" to bring you to our array of seating options. Select your tickets on the maps page by clicking the price box. From there, TicketGalaxy.com will bring you to our checkout. Get your UConn Women's Basketball tickets quickly and easily today! 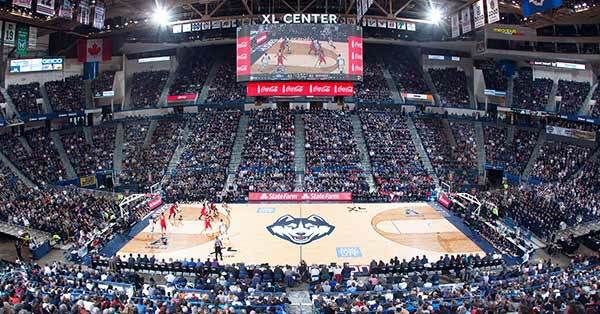 Ticket Galaxy is the Proud Partner of the UConn Athletics.